There have been, in the history of the world, a number of talking animals. Birds who learned to verbalize human language. Chimpanzees who learned to sign. 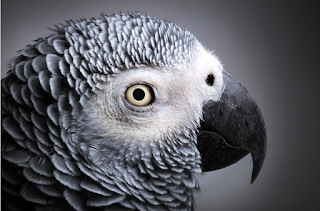 And among the many messages these animals have expressed, scientists have only one animal on record – an African Gray parrot named Alex – who has ever asked an existential question. Alex asked what color he was. One might conclude that there is, in the animals, a kind of existential contentedness that humans do not possess. As a person who struggles to accept life as it is, I envy any being with animalistic and unquestioning acceptance of a natural reality. And yet a certain discontented wonderment over one’s own existence seems ingrained in the very fiber of humanity. To stretch beyond what is currently known and what can currently be proven is to be fully human. What clearly distinguishes us from bird and beast? Questions. Well, questions and cable television bills. If you're like me and you have a lot of questions about the nature of existence, specifically YOURS, I'll be exploring it in this diary. Tell me what you want me to explore! Aliens? Energy grids? The nature of love? Go on, ASK A QUESTION: It's only human!